If society withholds social licence, would that stop fracking? In the ongoing row over fracking, what does “social licence to operate” mean? 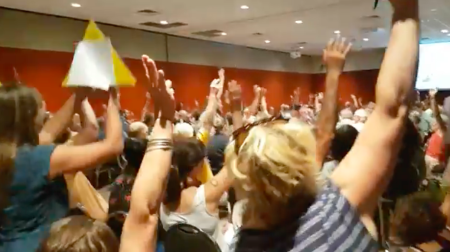 Consultants to the NT Hydraulic Fracturing inquiry, Coffey Services Australia, in deep water over messy community consulting by a firm it had engaged, defines social licence as “a measure of the acceptance of an industry within society”. So, if society does not accept it, does that mean society can – by majority vote, for example – stop fracking? Coffey also defines the key to the licence as the “information about how the communities’ concerns could be addressed”. • Identification, assessment and management of the potential social impacts. • Use the example of a possible unconventional shale gas project in the Beetaloo Sub-basin, which is where exploration is most advanced. • Describe, with reference to the literature and examples from other jurisdictions, the concept of a “social licence to operate”. There is nothing to indicate what the consequences are when society declines to give social licence. Lauren Mellor, from FrackFree NT, says the Coffey report released last week fails almost entirely to reflect what it was told in the “consultations” it was paid to conduct in the Beetaloo area. About the consulting flaws, Justice Rachel Pepper, head of the inquiry, said in a media release on October 7 last year that the inquiry “would like to express its profound dismay and concern at the comments allegedly made by Cross Cultural Consulting … engaged [by] Coffey Services Australia to conduct a social impact assessment on its behalf”. But Justice Pepper also “reiterated that the role of the inquiry is to report on the risks and issues of hydraulic fracturing for shale gas in the NT. So what is the point of the social impact assessment? And what is the point of consulting people when – as Ms Mellor claims – the message they give is all but ignored in the report? If “community consultations” are made then their outcomes would surely be the focus of the resulting Social Impact Assessment, no matter how small the attendance at hearings and meetings. Ms Mellor and her fellow activists have gone to considerable effort to get their facts. “I attended the majority of community consultations,” she says. “Audio recordings of these meetings are available in full. “CAAMA undertook this work of recording and reporting on these meetings to ensure there was a higher degree of accountability this time around. “The ABC video recorded the entire Mataranka meeting of about 40 people. They would also be able to provide a copy,” says Ms Mellor. “The notes that Coffey themselves took, and made commitments to provide to meeting participants, would further reflect the strong anti-fracking sentiments being expressed. • How many submissions have been received so far? • Not including industry and government submissions, of those which express support or opposition to fracking, what is the split-up? • The Coffey report says: “Broadly speaking, a ‘social licence to operate’ is a measure of the acceptance of an industry within society.” Does that mean society, by way of majority, can stop fracking? If so, how? If not, what does “social licence to operate” mean? How many submissions have been received so far? As of 22 January 2018 the Inquiry has received 530 written submissions. These may be accessed on the Inquiry’s website. Not including industry and government submissions, of those which express support or opposition to fracking, what is the split-up? The Inquiry has not undertaken an analysis of which submissions support or oppose fracking. This was not a requirement of the Terms of Reference. Rather, consistent with the Inquiry’s Terms of Reference, the Inquiry has identified the environmental, social, cultural and economic risks and impacts associated with hydraulic fracturing of shale gas reservoirs in the Northern Territory and examined ways that those risks can be mitigated to acceptable levels. Submissions have been sought and made on all of these risks. The Coffee report says: “Broadly speaking, a ‘social licence to operate’ is a measure of the acceptance of an industry within society.” Does that mean society, by way of majority, can stop fracking? If so, how? If not, what does “social licence to operate” mean? Coffey states that (there are in fact three reports, with an additional summary report), a “social licence to operate” is a measure of the acceptance of an industry or project in a community. Projects that do not have a social licence to operate often have high financial, opportunity and personal costs. Therefore, gas companies should earn and maintain a social licence to operate. A “social licence to operate” is not something given or acquired under law. As stated above, however, a ‘social licence to operate’ is something a gas company should earn and maintain. The Inquiry did not ask Coffey whether or not there currently existed a social licence to operate in respect of any possible onshore shale gas industry in the NT. Rather, the Inquiry asked Coffey to determine how any onshore shale gas industry can earn and maintain a ‘social licence to operate’ in the Northern Territory. Coffey made 11 principal recommendations in this regard. In summary, Coffey advised that this could occur by, among other things: (a) ensuring that the community is heard; (b) ensuring that the community benefits from the project; (c) ensuring that the Government properly regulates the industry; (d) ensuring that any impacts are properly managed; and (e) ensuring that a gas company properly engages with the community. VIDEO: Consultation with a surprise took place in Alice Springs in March last year when anti fracking campaigner Jimmy Cocking moved an unscheduled motion during a meting called by Judge Pepper. The only “social license” required and accepted under our constitution is that of our democratically elected government! As voters it is our responsibility to understand what a candidate stands for and to vote for or against them accordingly. Those elected are elected by a majority, that is their social license, to make decisions on our behalf. The term social license is a relatively new mechanism foisted surreptitiously into government decision making processes by minority groups such as the greens, unhappy with a democratic process that refuses to accept their blinkered back to the dark ages philosophy. It is part of a very deliberate and dangerous undermining of the democratic process and is rapidly becoming a threat to democratic government right around the world. The silent majority becoming more and more disillusioned, their wishes being described as populist and ignored in favor of and often tiny minority viewpoint, effected by the use of such mechanisms as social licence! Seeking to usurp the decisions of the majority by such means clearly runs counter to the intent of democratic government itself! Arguing that the thoughts and wishes of small gatherings of like minded activists at forums and public meetings be some how regarded as a majority view point of the general population is quite frankly bloody ridiculous! Governments are elected to make decisions if you don’t like their decisions and the majority agrees, you can kick them out at the next election. The most important part of any democratic decision? The bit the world seems to have forgotten? Is that for democracy to work, everybody, that means all sides of the debate, must accept the outcome. When we fail to understand and accept that seemingly simple concept, then we no longer have democratic government. I’ll answer that for you: What you see happening in Syria, that’s what replaces it, bloody mayhem. So maybe just maybe it’s time we all took stock and started treating our democratic process with the respect they deserve, following the wishes of a majority not some of the time, or when it suits. Governments need to get social licence and a huge amount of the community consult mumbo jumbo out of their language altogether, it simply amounts to procrastination, an excuse for the gutless not to decide. Toughen up, make your decisions. While we may run you out if we don’t like your decision, we will most certainly run you out if you sit there and procrastinate. Jimmy Cocking, you are legend mate.